The global epoxy powder coating market is expected to grow at a moderate pace during the forecast period of 2018-2023. Owing to its rapid growth in the construction and automotive industries, Asia-Pacific is estimated to lead the market. By end-user industry, the building & construction segment is expected to witness the fastest growth. By far, the construction industry is the largest consumer of epoxy powder coatings. With a rising number of building codes that promote eco-friendly and energy-efficient structures, home builders and consumers are gradually moving toward building strategies that deliver performance and energy savings over the long run. With the consistent economic growth in the Asian countries, such as India, China, Indonesia, Thailand, Malaysia, and Singapore, the demand for construction of new buildings, both commercial and residential, is consistently increasing, which, in turn, is increasing the demand for epoxy powder coatings in the Asian region. Alternative methods for hazard assessment of substances are being promoted, in order to reduce tests on animals. This is increasing the demand for coatings with low VOC content, such as epoxy powder coatings. Epoxy powder coatings are extensively used in the building & construction sector, as they are extremely resistant to abrasion, liquid penetration, heat, corrosion, deicers, UV rays, and chemical attack. They are also economical and environmentally friendly, as they do not contain solvents and emit virtually no hazardous air pollutants (HAPs) or volatile organic compounds (VOCs). The construction industry in Asia-Pacific is expanding at a robust pace, primarily in emerging economies, such as China, India, and ASEAN countries. In China, various projects, such as developing airports (New Beijing Airport), building roads (30,000 km of highways, with construction and up gradation of bridges), high-speed rail covering of 30,000 km, are expected to cover more than 80 cities and contribute to 60% of the urbanization ratio with permanent residents. The Indian government's ‘Housing for All by 2022’ scheme is a major driver for the boom of the construction industry. The Indian government’s initiative to develop smart cities and build almost 30 million homes by 2022, is likely propel the demand for epoxy powder coatings. The Indian government has also announced highway projects worth USD 93 billion, including government flagship project National Highways Building Project (NHDP), with a total investment of USD 45 billion, over the years to come. In the United States, new residential construction recorded an annual growth of 6.34% in 2016. During the first 10 months of 2017, the new residential construction recorded a growth of 2.43%, when compared to the same period in 2016. These factors are expected to boost construction activities, thereby increasing the usage of epoxy powder coatings. China’s Transport Ministry and National Development and Reform Commission (NDRC) have planned to invest USD 724 billion during 2016-2018, to construct 303 key transportation projects, including railways, highways, waterways, airports, and urban railways. Under the 13th five year plan (2016-2020), the Chinese government is planning for an infrastructure development of 30,000 km of railway lines and 30,000 km of expressways. The Indian government has declared a target of USD 376.5 billion investment in infrastructure over a period of 3 years, including USD 120.5 billion for developing 27 industrial groups, and USD 75.3 billion for road, railway, and port connectivity projects. In 2016, more than 4.48 million units of vehicles were produced in India. The production of passenger vehicles (PV), light commercial vehicles (LCV), and heavy trucks registered YOY growth rates of 7.9%, 8%, and 9.9% respectively in FY 2016. Due to the Winter Olympic Games in Pyeongchang, Gangwon province, held in Feb 2018, with the government’s plans to invest USD 10.8 billion for the construction of new stadiums and other associated infrastructure, the South Korean segment of the market studied received a boost. 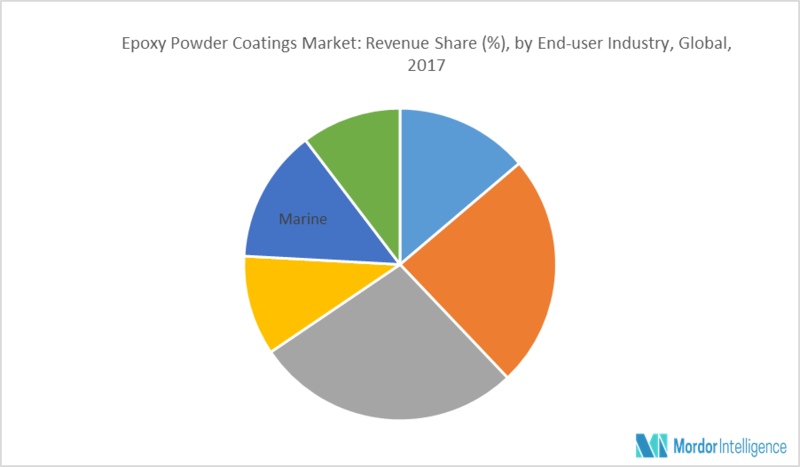 These factors are expected to drive the rapid growth of the Asia-Pacific epoxy powder coating segment of the market studied, over the forecast period. June 2017: Hempel established a new R&D facility solely focused on passive fire protection (PFP) coatings, near Barcelona, Spain. The center is likely to be fully functional by the end of 2018. August 2017: Axalta Coating Systems announced the acquisition of Plascoat Systems Limited from its parent company, International Process Technologies (IPT) Ltd. As a part of the agreement, Axalta would acquire both the Plascoat manufacturing facilities in Farnham (England) and Zuidland (the Netherlands). February 2016: AkzoNobel acquired BASF’s Industrial Coatings business and became the number one supplier of coil coatings in the world. Major Players: AkzoNobel, Axalta, 3M, PPG, Beckers Group, and BASF, among others.